The 12 Five Year Plan size is at Nu 310 bn according to the Foreign Minister Lyonpo (Dr) Tandin Dorji. He said that the figure is unlikely to change and that it would probably be sent to the GNHC Commission by next week and thereafter it would go to the cabinet for finalization. The entire Cabinet and the GNHC Secretariat have been working long hours into the evening over the last three weeks to incorporate DNT’s pledges and finalize the plan. Of the Nu 310 bn, the current expenditure, which is to do with salary, TA/DA, infrastructure maintenance, loan interest payment and general running of the government is Nu 194 bn. The capital expenditure which is to do with the construction of new infrastructure like roads, hospitals, schools etc is Nu 116 bn. 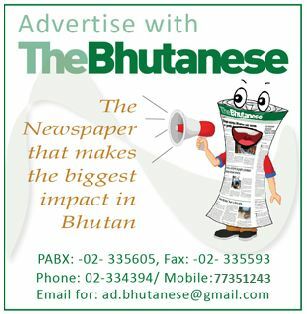 Of the Nu 310 bn Bhutan’s internal revenue will cover Nu 218 bn. Bhutan will be seeking Nu 63 bn in grants from various developmental partners. Of the Nu 63 bn grant Bhutan will seek Nu 45 bn from India, which is the same contribution as in the 11th plan. This is a significant move as it will mark the first time since the start of Bhutan’s five year plans in 1961 that an increase in grant is not being sought from India. 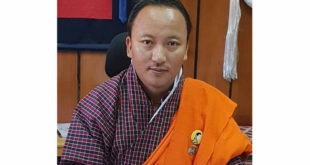 The former PDP government while coming up with the first version of draft 12th plan had proposed to not seek more than Nu 45 bn from India so that Bhutan can enhance its self sufficiency and in doing so its sovereignty. The current DNT government is holding to the same and is not seeking an increase in the grant from India. This means that from India funding 23 percent of the 11th plan would be funding 14.51 percent of the larger 12th plan. This is in line with the overall decrease on grant reliance in the 12th plan. 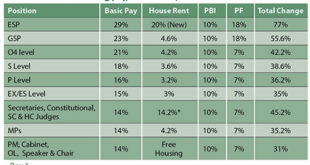 In the 11th plan Nu 68 bn in grant had been taken for a plan size of around Nu 217 bn which was 31.33% of the then plan. Now, marking an important turnaround Bhutan’s grant amount is coming down for the first time in its history to the lowest ever of 20.32 percent of the 12th plan. Apart from the 45 bn from India, Bhutan will seek around Nu 9 bn from other bilateral partners like Japan, EU countries and the remaining 9 bn in grants from multilateral agencies and international financial institutions. 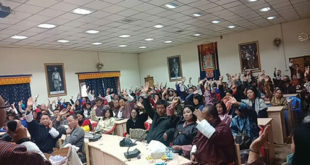 Lyonpo (Dr) Tandin Dorji said that around 90 percent of the DNT’s pledges had been incorporated in the plan and they would look to implement the others through other means. The shortfall in the plan is around Nu 29 bn which is 9.35 percent of the plan amount and the government will have to raise on its own. The shortfall in part is due to the additional delays forecast for the ongoing hydro projects like 720 MW Mangdechu, 1200 MW Punatsangchu 1, 1020 MW Punatsangchu II and also due to Nu 14 bn being lost through GST. One of the ways the government plans to meet the shortfall is by enhancing internal revenue.